An Ebola outbreak in the Democratic Republic of Congo has a clear "potential to expand", WHO warned Wednesday, amid news three people infected with the deadly virus had fled a local hospital. "It could go either way over the next few weeks and we are working around the clock to make sure it (goes) in the right direction," he told AFP after the meeting. The agency issued a new toll, saying there had been 58 cases since early April—an increase of seven over figures issued on Tuesday—and said it was actively following more than 600 contacts. 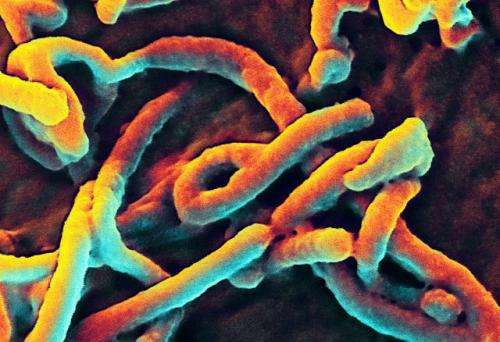 Ebola, a virus-caused haemorrhagic fever that spreads through contact with bodily fluids, is highly infectious and extremely lethal. The current outbreak, which was officially declared on May 8, began in rural northwestern DRC in a remote location called Bikoro. So far seven cases have surfaced in Mbandaka—a city of around 1.2 million people that lies on the Congo River, acting as a transport hub to Brazzaville and Kinshasa downstream and to Bangui, upstream. "An urban case means that it can spread quickly," WHO chief Tedros Adhanom Ghebreyesus told Wednesday's session during the agency's annual World Health Assembly. "They are connected, they are very close, and ... that makes the problem really serious," he said. The UN health agency is eager to show that it has learned hard-won lessons on how to deal with Ebola since the worst-ever outbreak of the virus, which killed more than 11,300 people in three West African countries from 2013-2015.
WHO faced harsh criticism for responding too slowly and failing to grasp the gravity of that outbreak until it was out of control. But Doctors Without Borders (MSF) reported a worrying development Wednesday that was eerily reminiscent of problems seen during the West Africa outbreak: three Ebola patients had fled a Mbandaka hospital since Sunday. MSF said two of them had died after returning home with their families. MSF, which supports the hospital in question, said it was important to understand that "forced hospitalisation" would not work. "The commitment of the patient" to being quarantined "is fundamental," it said, highlighting the need for public awareness on how to halt the outbreak. Matshidiso Moeti, WHO's regional director for Africa, insisted that the WHO had learned that lesson, pointing to "extremely important" efforts to get trusted community leaders involved in spreading information about how people can best protect themselves against the virus. African health authorities have meanwhile said they will send in a team of anthropologists to help smooth communication, especially around a vaccination campaign that started this week. "This is not mass immunisation, this is highly targeted ring vaccination," Salama said, pointing out that the aim was to form "protective rings around (each) case to protect the people themselves, but also to prevent further community transmission." He said some 10,000 people should be vaccinated within the next month. Salama stressed though that the vaccine is "not a silver bullet", insisting it "is really the detective work of epidemiology that will make or break the response." Only by finding every single Ebola case, and mapping and following every one of their contacts, and ensuring that the sick are isolated, can the epidemic be brought to halt, he said. Communicating safe behaviour to the population is also vital, Salama said, recalling that Ebola spreads through physical contact, including sexual contact, and that the virus can survive in the sperm of Ebola survivors for months and even years after they recover.